I remember the first lesson I tried to prepare on teaching students to identify the author's point of view. My state standards indicated that my fifth graders needed to be able to identify first person, second person, third person limited, and third person omniscient points of view. I "knew" that my first step was teaching students which pronouns were associated with each point of view. For example, I knew I had to teach my students that the pronouns, "I", "me", "our", and "us" were used by authors writing in first person. him the truth. What if he doesn't believe me? What if he thinks she is telling the truth? In this sample paragraph, there are both first person pronouns and third person pronouns! Now what?! I quickly realized that any pronouns within dialogue have to be ignored when determining point of view... and this included spoken dialogue (in quotation marks) and internal dialogue (written in italics). Furthermore, when teaching students to identify the author's point of view, crossing out dialogue had to be done before pronouns were considered. I also realized that there are a few other "rules". For example, if a text contained both first person pronouns and third person pronouns within the narrative (like in the example above), the point of view was always first person. Eventually, I came to the conclusion that a step-by-step approach was going to be the best way to introduce these concepts to students. I created the following anchor chart which helped my students immensely. Camera clip art is by Ashley Hughes. 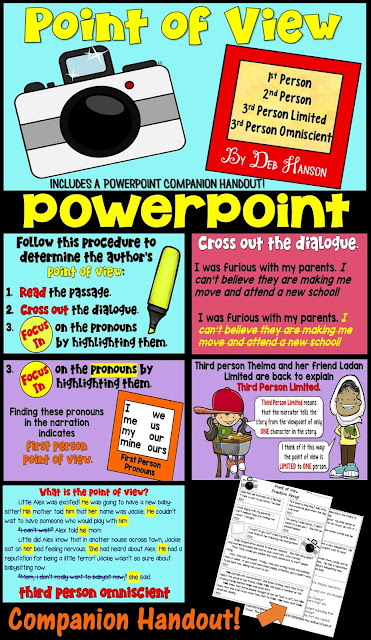 I created this anchor chart AFTER my students and I worked through my Point of View PowerPoint, which contains the same concepts. My students had great success when we went through the PowerPoint slides, but then a few of them struggled when the PowerPoint was turned off and they tried to work through the process more independently. I realized that those students still needed a bit of scaffolding before they internalized the process... and that's where this anchor chart came in! It worked like a charm!! Students who needed the support referred to it often. There was no excuse for any student to make a random guess! 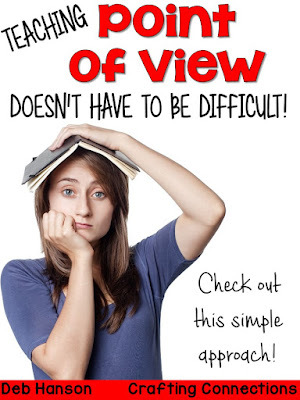 Also, I always had students justify the point of view they selected by explaining how they found their answer. Referring to this chart helped them to do that! I actually have two versions of the PowerPoint because I work with multiple grade levels. 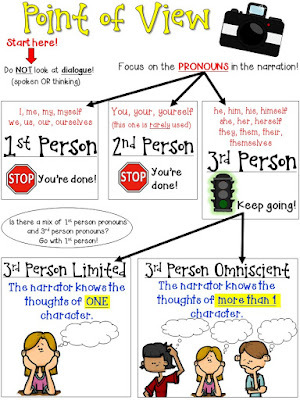 At our school, fourth graders focus mainly on first and third person, while fifth graders also learn second person and the differentiate between 3rd person limited and 3rd person omniscient. 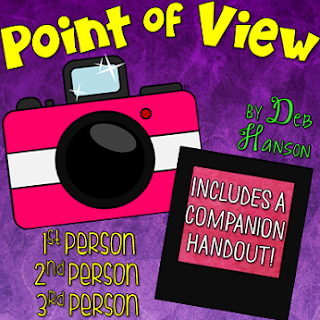 Finally, check out this FREE lesson (with printables to download) that I shared at my collaborative blog, Upper Elementary Snapshots! You're anchor charts are the BEST!!!! !